Department of Herbal Crop Research, NIHHS, RDA, Eumseong 27709, Korea. © The Korean Society of Medicinal Crop Science. All rights reserved. This is an Open-Access article distributed under the terms of the Creative Commons Attribution Non-Commercial License ( http://creativecommons.org/licenses/by-nc/3.0 ) which permits unrestricted non-commercial use, distribution, and reproduction in any medium, provided the original work is properly cited. Astragalus membranaceus belonging to the Leguminosae family is often utilized as a traditional medicine. The aim of this study was to elucidate the basic breeding information required to develop short stem A. membranaceus cultivars. Roots of A. membranaceus advanced yield trial (AYT) lines were harvested in late October 2017. Root yield of six AYT lines were increased in a range of 8.9 - 74.8% compared with ‘Aseong’ as control (check variety). The height of seven AYT lines were shorter than that of ‘Aseong’. In addition, stem diameter of nine AYT lines was thicker than that of ‘Aseong’. Consequently, 1502-56, 1503-90, and 1510-80 were selected as elite lines for the development of short stem cultivars. 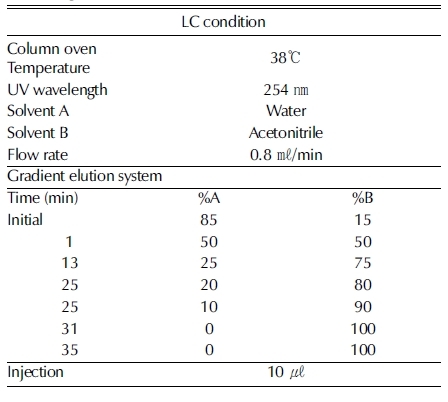 HPLC analysis was perfromed to identify lines with high level active components such as calycosin-7-O-β-D-glucoside and calycosin. The levels of both active components were higher in 1502-56, and 1503-90, but not in 1510-80 compared to ‘Aseong’. 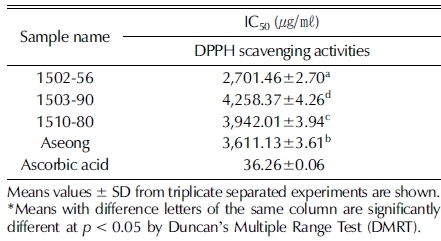 In addition, 2,2-Diphenyl-1-picryl hydrazyl (DPPH) radical scavenging activity was higher in the 1502-56 compared to ‘Aseong’. 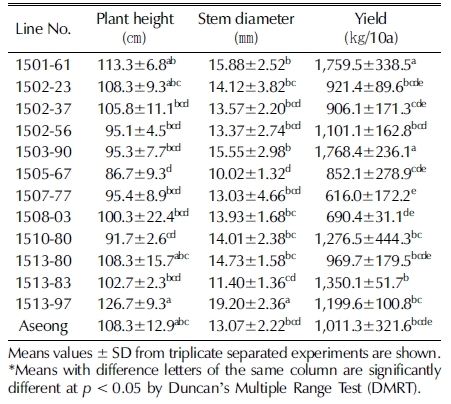 Considering these results, two AYT lines, 1502-56 and 1503-90 were selected as short stem lines with high calycosin-7-O-β-D-glucoside and calycosin content. Taken together, Two short stem lines were identified in this study. In our future study, regional yield trial (RYT) will be conducted using these selected lines to develop new cultivars. 황기 [Astragalus membranaceus (Fisch) Bunge]는 콩과 (Leguminosae)에 속하는 다년생 식물로서 한국, 중국, 몽고 등 동북아시아 지역이 원산지이다. 아시아, 유럽 및 아프리카 일 부 지역에서 분포하며, 우리나라에서는 강원도, 충북, 경기도 지역에서 주로 재배하고 있다. 현재 국내 황기의 주산단지는 강원도 정선, 삼척 및 충북 제천이다. 2017년 기준으로 황기의 전국 재배면적은 약 207 ha, 수 확면적은 178 ha이고, 국내 생산량은 491 톤으로 조사되었다 (MAFRA, 2018). 농림축산검역본부의 2017년 수입통계에 위 하면 황기의 수입량은 898 톤으로 국내 생산량 대비 수입량 이 높은 작물로 나타났다. 황기의 이용부위는 뿌리로 식품으로는 1년생을 사용하며, 약 용으로는 주로 3년생과 6년생을 사용하고 있다. 대한민국약전에 따르면 황기는 ‘황기 또는 몽골황기 (Astragalus membranaceus Bunge var. mongholicus Hsiao)의 뿌리’이며, 이 뿌리를 그대 로 또는 주피를 제거한 것이다. 황기는 신농본초경에서 상품 (上品)의 약으로 기록되어 있 으며, 민간에서는 강장제로 쓰여 왔다 (Goh et al., 2009). 한 방에서는 가미대보탕 (加味大補湯), 보중익기탕 (補中益氣湯), 십전대보탕 (十全大補湯), 쌍화탕 (雙和湯), 청서익기탕 (淸暑 益氣湯), 황기건중탕 (黃耆建中湯), 황기보위탕 (黃補胃湯) 등 수 백 개의 처방에 사용되어 왔다 (Kim et al., 1996). 황기의 주요 성분은 polysaccharide와 saponin, flavonoid이며, astragaloside I-IV, linolic acid, β-sitosterol, linolenic, choline, lupenone, friedelin, lupeol, cycloastragenol, calycosin-7-O-β- D-glucoside, calycosin, ononin 등의 성분이 알려져 있다 (Kim and Kim, 1997;Song et al., 1998;Jung et al., 2008;Kim et al., 2012;Park et al., 2013). 또한 간기능 보호효과, 간암세포의 전이 억제, 대장암세포의 증식억제, 면역기능 증진효과, 비인두암세포 성장억제, 유방암 세포의 침윤 억제, 신경보호, 항당뇨, 항바이러스, 항산화, 항신 경염증, 항알러지 등의 효능이 있는 것으로 보고되었다 (Baek et al., 1996;Rios and Waterman, 1997;Song et al., 1998;Goh et al., 2009;Yin et al., 2009;Yang et al., 2016;Jiang et al., 2017;Qin et al., 2017;Xia et al., 2017;Kim et al., 2018;Kong et al., 2018;Li et al., 2018;Wang et al., 2018). 황기는 재배방법의 하나인 적심을 통해 도복을 방지하고, 수 확량을 늘릴 수 있으며, 적심 횟수는 농가 및 지역마다 조금 씩 다르지만 보통 3 회이다. 적심은 농가에서 시간과 비용이 많이 드는 작업이고, 다년생 황기를 재배하는 농가의 경우 해 마다 작업을 진행해야 한다. 지금까지 육성된 황기 품종은 대부분 장간으로 적심이 필요 한 품종이다. 농가에서는 적심이 필요 없는 단간 품종이 필요 한 실정이나, 아직까지 그러한 품종은 육성되지 않았다. 따라 서 본 연구는 현재까지 육성된 황기 계통들을 평가하여, 적심 이 필요 없는 단간형태이며 고품질인 황기 품종을 육성하기 위한 기초자료를 만들기 위해 수행하였다. 실험에 사용된 재료는 국립원예특작과학원 약용작물과 시험 포장에서 2017년 4월 중순에 정식하고, 2017년 11월 상순에 수확한 황기 [Astragalus membranaceus (Fisch) Bunge] 계통 을 사용하였다. 재배방법은 검은색 PE필름으로 멀칭한 시험구 (1 m × 5 m)를 설치하고, 재식거리는 조간거리 50㎝, 주간거리 20㎝으로 하였으며, 처리별 시험구 배치는 난괴법 3 반복으 로 배치하였다. 생산량 검정은 농촌진흥청 시험연구 조사기준 에 준하여 실시하였으며, 채취한 시료는 수세 후 동결건조 한 다음 반복 당 10 주씩 총 30 주를 균일하게 분쇄하여 혼합한 후 분석에 사용하였다. Calycosin-7-O-β-D-glucoside, Calycosin 표준품은 Sigma- Aldrich 제품 (St. Louis, MO, USA)을 구입하여 사용하였으 며, 검액은 20㎎의 분쇄된 건조 황기를 1㎖의 80% methanol에 현탁하여 15 분간 초음파 추출한 후, syringe filter (0.45㎛)로 여과하여 사용하였다. 분석은 Agilent 1100 Series HPLC System (Agilent Technologies Inc., Santa Clara, CA, USA)을 이용하였고, column은 YMC-Pack ODS-AM (4.6 × 250㎜, 5㎛, YMC Co., Ltd., Kyoto, Japan)을 이용하였다. 분석 조건은 Table 1과 같고, calycosin-7-O-β-D-glucoside, calycosin의 chromatogram은 Fig. 1과 같다. LC analyisis condition of calycosin, calycosin-7-O-?-Dglucoside, in A. membranaceus. 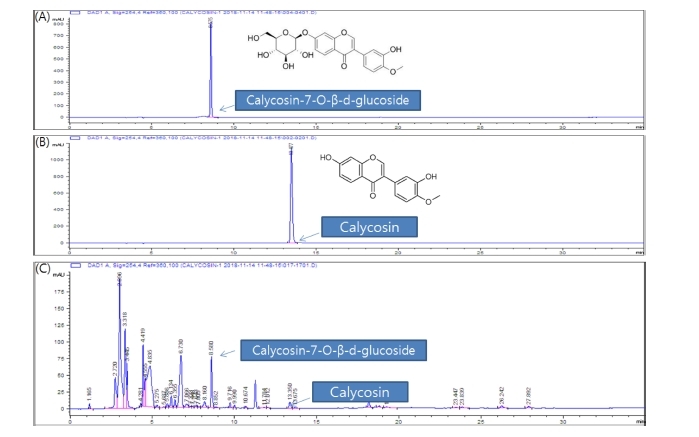 Selected chromatogram of calycosin-7-O-β-D-glucoside (A) calycosin (B) and sample (C) from A. membranaceus. 정량분석을 위해서 표준물질을 0.05, 0.025, 0.013, 0.006, 0.003㎎/㎖의 농도별로 methanol에 녹인 후 LC 분석을 실시 하여 검량선을 작성하여 방정식을 만들었고, 이 식을 이용해 서 정량분석을 실시하였다. Calycosin-7-O-β-D-glucoside의 방 정식은 Area = 45.8369129x - 4.0306207, calycosin의 방정식은 Area = 102.689245x - 2.609238 (x =㎎/㎖)이었다. DPPH radical 소거능 측정은 Lee 등 (2015)의 방법을 이용 하였다. 100 mM의 DPPH 메탄올 용액을 제조한 후, 여과하여 사용하였다. 시료는 농도별로 제조한 후 (0.1, 0.3, 0.5, 0.7, 1㎎/㎖), 시료 40㎕에 DPPH solution 160㎕을 첨가한 후 23℃ 암실 에서 30 분간 반응시킨 후 517㎚에서 흡광도를 측정하였다. 대조구는 L-ascorbic acid를 사용하였고, 대조구와 비교실험하여 아래의 식으로 계산하였다. DPPH radical 소거능은 DPPH radical을 50% 감소시키는 농도인 IC50 (㎍/㎖)값으로 표현하였다. 실험결과는 SAS Enterprise Guide 4.2 (Statistical analysis system, 2009, Cray, NC, USA)로 분석하였고, 3 반복한 결 과 값을 평균치 ±표준편차 (means ± SD)로 나타내었다. 시료 간의 유의적인 차이는 Duncan’s Multiple Range Test (DMRT)로 유의수준 5% (p < 0.05)에서 검증하였다. 초장은 황기 [Astragalus membranaceus (Fisch) Bunge] 의 근과 경의 시작점부터 지상부의 끝 부분까지의 길이를 측 정하였고, 경의 굵기는 경의 시작점에서 측정하였다. 황기의 생산력 검정 계통의 초장은 86.7 - 126.7㎝ 범위로 나타났고, 대비 품종인 아성에 비해 초장이 작은 계통은 8 개였으며, 특 히 100㎝ 미만인 계통은 1502 - 56, 1503 - 90, 1505 - 67, 1507 -77, 1510 - 80의 5 개 계통이었다 (Table 2). Agronomic characteristics of A. membranaceus lines. 경의 굵기는 10.02 - 19.20㎜ 범위로 나타났고, 대비 품종인 아성에 비해 통계상 비슷하거나 굵은 계통은 1501 - 61, 1502 - 23, 1502 - 37, 1502 - 56, 1503 - 90, 1508 - 03, 1510 - 80, 1513 - 80, 1513 - 97의 9 개 계통이었다. 황기 계통의 생산력 검정 결과 생산량은 616 - 1,768㎏/10a 범위로 나타났고, 대비 품종인 아성에 비해 생산량이 높은 계 통은 1501 - 61, 1502 - 37, 1502 - 56, 1503 - 90, 1507 - 77, 1510 - 80, 1513 - 83, 1513 - 97의 6 개 계통이었다. 특히 1501-61은 생산량이 아성 대비 74%나 증수되는 우량 계통으 로 생각되어지나, 초장은 아성보다 큰 장간 형태로 선발 기준 에는 부합하지 못하였다. 도복은 초장이 길고, 경의 굵기가 이를 뒷받침할 정도로 굵 지 못하였을 때 잘 일어난다. 즉, 초장이 작고, 경의 굵기가 굵을수록 도복은 잘 일어나지 않는다. 수수의 경우 초장과 경 이 내도복의 기준 중 하나이며, 초장이 작고, 경이 굵은 내도 복성 품종도 육성된 바 있다 (Choe et al., 2016). 또한 황기는 도복을 방지하기 위해 초장이 대략 100㎝ 전 후가 되도록 적심을 한다. 이러한 상황을 종합해 볼 때, 적심 이 필요 없는 계통은 초장 100㎝ 미만에 경의 굵기가 대비 품종보다 비슷하거나 굵어야 될 것으로 판단된다. 또한 기존 의 품종인 아성보다 비슷하거나 높은 생산력을 가져야 될 것 으로 판단된다. 이 세 가지 선발 조건을 만족하는 단간·다수 성인 계통은 1502 - 56, 1503 - 90, 1510 - 80의 3 개 계통으로 나타났다. 단간·다수성인 3 개 계통의 품질평가를 통한 2 차 선발을 위하여 유효성분과 항산화활성 분석을 수행하였다. 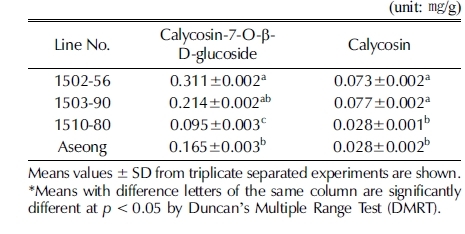 황기의 유 효성분인 calycosin-7-O-β-D-glucoside은 1510 - 80 계통을 제 외한 2 개의 계통에서 함량이 아성보다 많았고, 특히 1502 - 56 계통은 아성 대비 1.9 배나 많은 함량을 보였다 (Table 3). Calycosin도 calycosin-7-O-β-D-glucoside와 유사하게 1510-80 계통을 제외한 2 개의 계통에서 함량이 아성보다 많 았으며, 아성 대비 2 배 넘게 많은 함량을 보였다. DPPH radical 소거능은 1502 - 56 >아성 > 1510 - 80 > 1503 - 90 순으로 높게 나타났다 (Table 4). DPPH free radical scavenging activity of A. membranaceus lines. 그러나 약용작물인 홍화자, 향부자, 형개, 작약의 IC50 값은 4.4 - 148.2㎍/㎖으로 보고된 바 있는데 (Hwang et al., 2011;Sung et al., 2018), 본 연구 결과의 황기 계통 IC50 값은 2,701.5 - 4,258.4㎍/㎖로 나타나 항산화 활성이 매우 낮은 것 으로 판단된다. 또한 Park (2002)이 보고한 황기, 국화, 구기자, 감초, 당귀, 대추, 작약, 천궁 추출물의 항산화 활성 비교 연구결과에서도 황기는 같은 콩과인 감초와 마찬가지로 낮은 항산화 활성이 있는 것으로 나타났다. 품질평가를 진행한 3 개의 단간·다수성 계통 중에 아성보다 유효성분이 높아 선발이 가능한 계통은 1502 - 56, 1503 - 90의 2 개 계통으로 나타났다. 그러나 황기의 항산화 활성은 너무 낮은것으로 판단되어 선발 기준에는 부합하지 않는 것으로 사 료된다. 현재 약용작물 품종 개발의 기준은 과거의 내병성, 다수성 에서 유효성분 함량, 항산화 활성 등 다양한 품질 기준도 추 가되고 있는 추세이다. 베타인 함량이 높은 구기자 품종, catalpol 함량이 높은 지황 품종, 항산화 활성이 높은 수수 우 량계통 등이 보고된 바 있다 (Kim et al., 2008;Ju et al., 2015;Jeon et al., 2016). 황기도 이러한 추세에 맞추어 생산력 검정 계통에서 단간, 경경, 생산량, 유효성분 함량, 항산화 활성의 5 가지 기준에 맞추어 선발하려 했으나, 항산화 활성이 매우 낮은 것으로 판 단되어 4 가지 기준으로 선발한 결과 1502 - 56, 1503 - 90 계 통을 선발하게 되었다. 본 연구결과를 종합해보면, 단간종이면서 경이 굵고, 유효성 분이 높은 계통은 1502 - 56, 1503 - 90의 2 개 계통으로 나타 났으며, 선발된 계통들은 추후 지역적응성시험을 거치면 고품 질의 단간 품종으로 개발될 것으로 사료된다. 또한 이 계통들 에서 품종이 개발된다면, 농가 보급을 통해 적심비용 절감 및 생산량 확대를 통한 농가 소득 및 자급률 향상에 도움이 될 것으로 사료된다. 본 연구는 농촌진흥청 황기 고품질 품종육성 및 재배기술 개선 연구사업(과제번호: PJ01028802)의 지원에 의해 이루어 진 결과로 이에 감사드립니다. Baek, NI, Kim, YS, Kyung, JS, Park, KH, (1996), Isolation of anti-hepatotoxic agent from the root ofAstragalus membranaceus, Korean Journal of Pharmacognosy, 27, p111-116. Goh, EJ, Seong, ES, Lee, JG, Na, JK, Lim, JD, Kim, MJ, Kim, NY, Lee, GH, Seo, JS, Cheoi, DS, Chung, IM, Yu, CY, (2009), Antioxidant activites according to peeling and cultivated years ofAstragalus membranaceusroots, Korean Journal of Medicinal Crop Science, 17, p233-237. Jung, HS, Lee, EJ, Lee, JH, Kim, JS, Kang, SS, (2008), Phytochemical studies on root Astragalus root(3)-triterpenoids and sterols, Korean Journal of Pharmacognosy, 39, p186-193. Kim, DH, Park, CH, Park, HW, Park, CG, Sung, JS, Yu, HS, Kim, GS, Seong, NS, Kim, JC, Kim, MS, Bae, SG, Chung, BJ, (2008), A new high-quality, disease resistance and high-yielding Rehmannia glutinosa cultivar, “Kokang, Korean Journal of Breeding Science, 40, p84-87. Kim, JS, Kim, C, (1997), A study on the constituents from the roots ofAstragalus membranaceus(II), Korean Journal of Pharmacognosy, 28, p75-79. Kim, JS, Kim, YT, Kim, CS, (1996), A study on the constituents from the roots ofAstragalus membranaceus(I), Korean Journal of Pharmacognosy, 27, p336-341. Kim, NS, Choi, DJ, Choi, EJ, Lee, JH, Park, S, Lee, YS, Lee, JW, Lee, DY, Kim, GS, Lee, SE, (2018), Screening and evaluation of the anti-allergic effect of Korean medicinal plant extracts, Korean Journal of Medicinal Crop Science, 26, p42-54. Ministry of Agriculture, Food and Rural Affairs(MAFRA)., (2018), 2017 an actual output of crop for a special purpose, Ministry of Agriculture, Food and Rural Affairs, Sejong, Korea, p7. Park, YS, (2002), Antioxidative activities and contents of polyphenolic compound of medicinal herb extracts, Journal of the East Asian Society of Dietary Life, 12, p23-31. Song, BK, Lee, EJ, Kim, HK, Jin, SD, Kim, SJ, Kim, DH, (1998), Effect ofAstrgaliradix on the function of murine immunocytesin vivoandin vitro, Korea Journal of Herbology, 13, p115-128. Sung, JS, Jeong, YJ, Kim, DJ, Assefa, AD, Jeon, YA, Hur, OS, Ro, NY, Ko, HC, Ok, HC, Rhee, JH, Lee, MC, Baek, HJ, (2018), Oil compositions and antioxidant properties of safflower germplasm collected from East Asia, Korean Journal of Medicinal Crop Science, 26, p32-41. Yin, Y, Heo, SI, Jung, MJ, Wang, MH, (2009), Antioxidant and antidiabetic effects of various sections ofAstragalus membranaceus, Korean Journal of Pharmacognosy, 40, p1-5.